We are living in a generation where technology has been a gamechanger in making our lives more comfortable and subtle. Gone are the days of computers occupying a full room space. Sigh! Today, when you think of assembling your normal or gaming PC with the latest builds and specifications, selecting a perfect ATX case can be a lot of confusion. Usually, most of us prefer specifications which would occupy less space. Here, in this post, our product review team has spent a lot of sweat in bringing you the best and the smallest ATX case options that would even fit inside your travel trailer. We reviewed more than 32 ATX cases internally and later skimmed the list to 10 best small ATX cases. While selecting these cases, we spent a lot of time understanding the technology behind their design, how would the air flow be like and how each element like the sound card, RAM, graphics card, motherboard etc would fit inside the cabinet. It is time to check the detailed reviews. 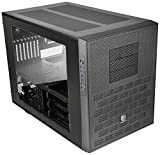 Our suggestion would be that you subsequently check the ATX cases on Amazon while reading their review on our website. This would further help you to compare the options in a better way. Cooler Master is a company worth trusting. All thanks to the great docket of products that it provides in an affordable price range. This computer hardware manufacturing giant also has control over the ATX case manufacturing industry. 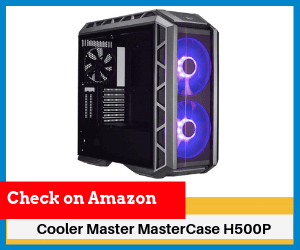 Cooler Master MasterCase H500P is one of the best small ATX cases that you will find in the market. You will certainly fall in love with the appearance of this ATX case. It has a radical and arduous build which makes it unique. There are three fans already included with this ATX case. Two RGB fans on the front that deliver gleaming lights and a better look to the whole setup and one normal fan on the rear. It has tempered glass on the side which offers a clear view to the insides of the ATX case. This tempered glass lets you view the components inside the casing and it would be better if you all use RGB LED light elements in your setup. This ATX case also has covers for cable management. Price is one thing companies should pay attention to. Honest pricing wins the customer’s heart. Unfortunately, the price of the Cooler Master MasterCase H500P is a bit too high for an average consumer. Though it would be a thrilling addition if you are a gaming enthusiast. 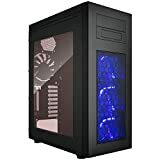 The cabinet is visually appealing and would give you an adrenaline rush every time you are playing a one person shooting games like Max Payne or Call of Duty on your PC. It has two pre-installed 200mm RGB fans on the front and one 140mm fan on the rear. It has a CPU cutout cover and a PSU shroud. You will get additional cable covers for a more decent cable management. Includes two supplementary PCI slots at the back for mounting the graphics card vertically. It has support for three extra 200mm radiator fans on the top, a smaller 120mm at the back and a small 120/140mm fan on the front. 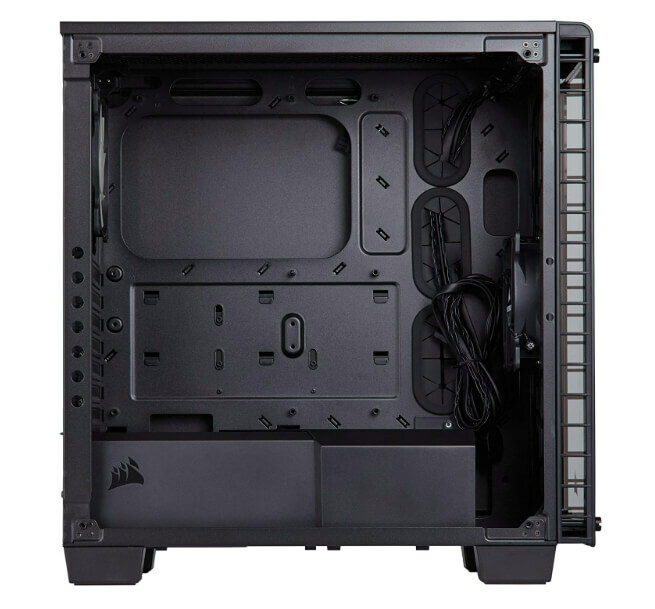 It has a tempered glass side panel which gives a clear view to the inside of the ATX case. The overall design of this ATX case is quite stunning. The fan casing and cable cover assist in having a cleaner look. The support for additional cooling fans is a boon for gamers. The pre-installed fans out of which two are RGB LED light equipped makes the setup look premium. The side cover is not just a regular glass panel. It is a tempered glass which does not shatter easily like the ordinary ones. The cable management is excellent with this ATX case as a PSU shroud, CPU cutout cover and cable covers are already provided with the package. The price of this ATX case is a bit higher from an average customers standpoint. Corsair is a company which has never failed to amaze the customers with its great lineup of products. It manufactures all major computer hardware products like RAMs and ATX cases are one of them. The Corsair Crystal 460X looks incredible as it is mostly transparent. It has a wonderful two-panel tempered glass which makes it convenient for us to see all the components inside the ATX case. This ATX case is capable of handling liquid cooling at ease. There is enough room on the front, top and rear to install radiators which will cool down all the heat generated very easily. The Corsair Crystal 460X is also very easy to build and even easier to maintain. Also, a PSU shroud and a 3.5-inch bay cover are provided with the package which really helps in handling all the cables and making the whole setup look cleaner. 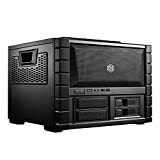 If we talk about the pricing of this ATX case, then we would definitely say that it is a bit overpriced for the features provided but again, you are getting a product of a brand that offers great after sale support to its customers. It has a good looking build with two astonishing tempered glass panels that gives you a clear view of the inner components placed in the ATX case. It has an all steel exterior leaving the tempered glass portion of course. It has liquid cooling support for the CPU and GPU loops both. The complete package also includes AF140L and AF120L fans for better cooling and noise dampening. It is capable of filtering all the dust from the front, top and back as it has sufficient space for placing radiators. The cable management has been taken care of, as there are multiple cable routing options so that the cables do not come in the way of any other component. 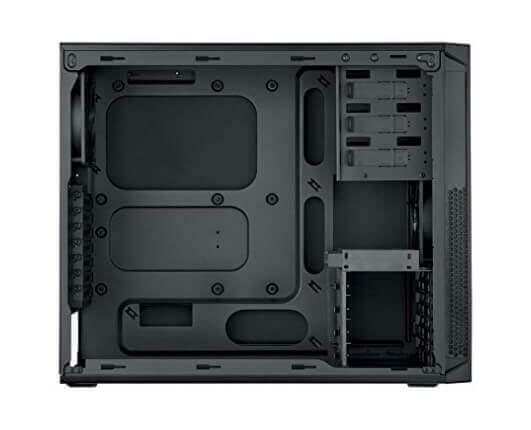 The front of this ATX case is capable of fitting a single 360mm radiator or multiple 120mm or 140mm radiators. The ATX case looks marvelous all in all and this is a major highlight as customers always pay attention towards the overall appearance or the looks of a product before buying it. The liquid cooling support and the space provided for placing the elements is great. The AF140L and AF120F fans already provided with the bundle add up to the value of the purchase. The PSU shroud and the 3.5-inch bay cover are also very effective as they give a clean look and also add up to the value of the purchase. The cable management has been made smooth and you can easily handle all the cable without them going haywire. There are two tempered glass panels which enhance the beauty of this product and also provide better protection than some ordinary glass. Not good if you have to manage a ton of cables. 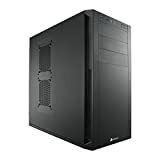 It is compact for a reason and you should go for it only if you are really planning to buy a compact ATX case. Rosewill is small or we can say, a mediocre company with no such famous products that we can talk about. This company majorly builds computer components and peripherals. 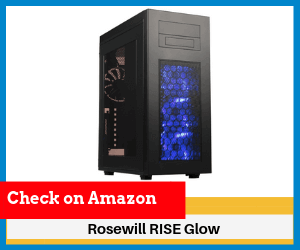 It’s gaming ATX cases are the most notable and the Rosewill Rise Glow Case is one of the best ATX case that this company has built and also if we compare it to the other ATX cases in the market then this gives serious competition to the others. The Rosewill Rise Glow comes knitted with three blue LED light 140mm fans on the front and an ordinary 120mm radiator fan on the rear. The blue LED light fans to add a little flair to the setup. This ATX case also has additional spaces for adding more radiator fans on the top and the rear. Two 120mm fans or 1400mm fans can be installed on the top of the case and one 80mm fan can be installed on the back panel. There is a transparent side panel for viewing the inner elements of the whole setup. This ATX case also supports liquid cooling which is used for a better cooling experience. The whole bundle is very budget friendly and offers the best specifications. If assembled properly, the whole ATX case and all the elements inside it will give a beautiful look to the setup. It comes with three pre-installed 140mm blue LED light fans on the front and one pre-installed 120mm fan at the back. It has additional space for installing two 140mm or 120mm fans on the top and one 80mm fan on the rear. There is support for 280mm liquid radiators on the top and 360mm radiators on the front. It has a transparent side panel for a clear view of the components inside the ATX case. The interior is engineered to provide untrammeled airflow for better performance. The pre-provided fans extend the value of the ATX case or the whole bundle, especially the 140mm fans placed on the front. These fans have a vivid blue LED light that adds to the beauty of the ATX case. There are enough extra spaces provided for installing more fans. Additional fans mean additional cooling support. The liquid cooling support is superb and makes this ATX case more operational. The transparent side panel is present which is trendy these days. The price at which this ATX case provides the functionality is commendable. It has all the important features at the best possible price. The transparent side panel is not made of tempered glass. 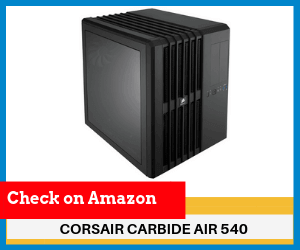 The Corsair Carbide Air 540 is a beast. This ATX case has an eccentric design if we compare it to the other ATX cases. We know that it may not be perfectly designed but it still is highly functional and easy to operate. This ATX case has outstanding cooling support as it also has high expansion limits. Up to six 120mm fans or five 140mm fans can be installed on this little elephant of a case. 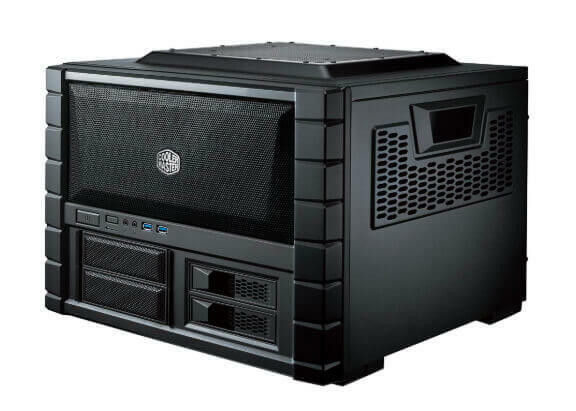 The AF140L fans already present with this ATX case are quiet in operation and also perform really well. Dust is also filtered in a very comfortable manner out of this. One side panel is transparent as it goes with the new trends. We can clearly watch what’s going on inside the whole setup and it also looks pretty cool. The problem with this ATX case can be that some people want their cabinets to be smaller but this, this is one of the biggest and the heaviest ATX case available in the market. It has dual chambered engineering for optimal cooling performance. It is designed cleverly so there is a lot of room inside to fit in all the elements easily. It already includes three AF140L fans for quieter and better airflow. It has front dust filters. It has a transparent glass side panel for better viewing. The uncanny design surely looks a bit off when we first see it but its strangeness makes it different from the others. This ATX case is so big that it has a lot of space to fit radiator fans and all the liquid cooling physicals easily. The pre-installed fans work without making any noise and also deliver the best performance. It has that glass side panel that every ATX case should have these days. The cable routing system granted by Corsair on this ATX case makes everything a little less jam-packed. The price at which all of this is presented to the customer is satisfactory. This ATX case is huge. The size is so big that most of the people would not want it. People want compact and sometimes portable ATX cases because it makes everything so easy to handle. Thermaltake is another PC components manufacturer that delivers decent products at a great price. They manufacture PC cases, cooling devices, peripherals etc. 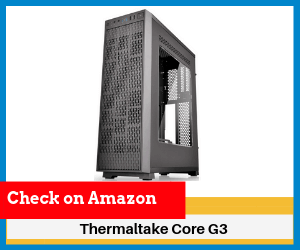 The Thermaltake Core G3 is a very slim ATX case that is easy to handle and transport from one place to another. Thermaltake paid a little more attention towards the portability and added padded braces and travel foams to support the hardware and therefore allowing us to carry it around freely. It is especially a gaming ATX case as it is ready for playing 4K virtual reality games. Also, it provides superior cooling performance. 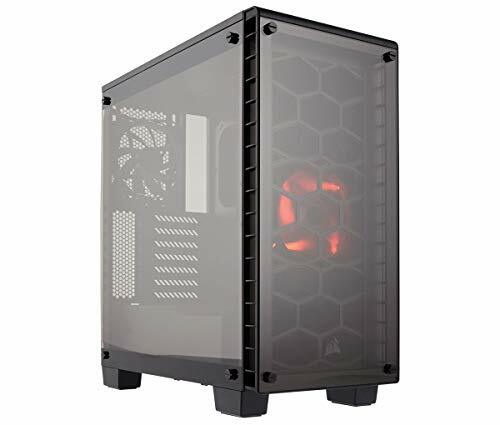 This ATX case also has the transparent glass side panel which is in fashion these days. 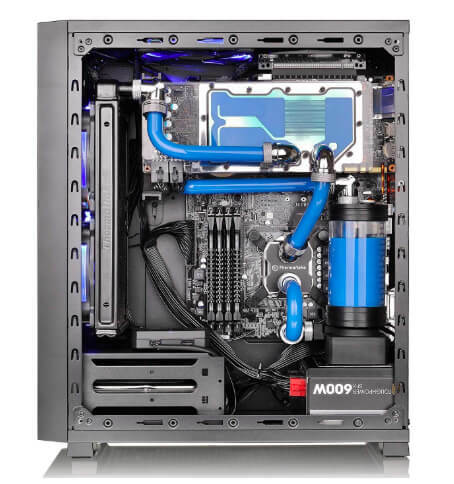 It also has full support for liquid cooling and additional radiator cooling fans. There are two 120mm fans pre-installed on the front with this ATX case. The whole bundle is very economical and would definitely be satisfactory for the customers. It has two 120mm radiator fans pre-knitted on the front panel. This case is engineered for gamers as it fully supports 4K virtual reality gaming. It has padded braces and travel foams so this makes it easy to carry around. It can be placed both horizontally and vertically as it is so slim. So it is easy to fit anywhere. One of the side panels is made out of glass and is transparent which lets us view the inner components of the whole build. The pre-installed fans prove to be highly functional and add up to the value of the purchase. Though the whole ATX is big but its so slim that it easily fits into small spaces and also Thermaltake provided us with padded braces and travel foams so shifting it, again and again, would not be much of a trouble. The special emphasis on gaming made by Thermaltake is really appreciative. The support for 4K virtual reality gaming is something new in this price segment. The transparent glass side panel follows the trends. The price of this ATX case is highly satisfactory. All the features and the slim looks packed with this price are great. There are not many slots for installing additional radiator cooling fans. So, the cooling performance may not be as good for high end gamers. The Corsair Carbide 400C ATX Case looks quite clean and sophisticated at the same time. The entire front, side, and the top panels are made out of solid steel. This makes the whole setup look more premium. 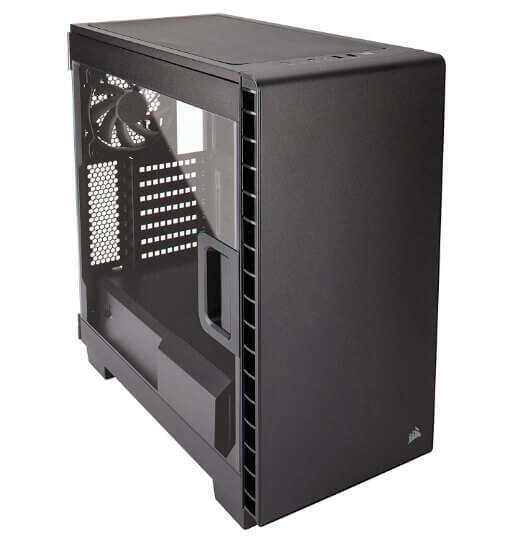 This ATX case goes with the trends as it has a side panel window just like all the other latest ATX cases. This lets us take pleasure in viewing the inner components. The best thing is that this glass panel is hinged and latched so it is easy to open anytime we please. It has support for liquid coolers as it has enough room for a 360mm radiator in front, 240mm radiator on top and a 120mm radiator at the back. The package already includes one AF120L fan and an AF140L fan. This makes everything a bit cooler and quieter. It also has a PSU shroud and a 3.5-inch bay cover which makes it easy handling the wires. The price is one thing that we really liked about this ATX case. All the premium looks and the tough build covered by the smooth operation is highly affordable. Corsair went with honest pricing and made it easy for the customers to buy this behemoth at a highly affordable rate. It has an all steel body with one side glass panel that is properly hinged and latched for better operability. The bundled AF120L and AF140L fans offer great performance and less noise. It has a compact design but enough space to place all the elements easily. The ATX case is liquid cooling capable and offers room for placing radiators on the top, front and rear. PSU shroud and 3.5-inch bay covers are already included. There are easily accessible dust filters on the front, top, and bottom. The all-steel build gives it the best in class looks and makes it more sturdy. The hinged and latched transparent glass panel on the side makes it really easy to tweak any component inside whenever we please. We do not have to remove the whole panel now. Also, viewing the inner components is easy. The dust filtration is great and the airflow is also splendid. It is compact but still has adequate room to place all the components like the liquid cooling system and the cooling fans easily. The wire management is greatly handled by Corsair and PSU shroud and 3.5-inch bay covers are also bundled with the package. The AF120L and AF140L fans work without making unnecessary noise and amazingly increase the airflow. The attachments on the front of the case are made out of plastic and not very sturdy. 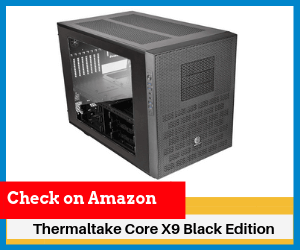 The Thermaltake Core X9 Black Edition ATX case is a cube case and is highly expandable. Enormous liquid cooling systems can be made out of this ATX case. The best thing about this ATX case is that it multiple ATX cases can be stacked on top of one another to give room to endless liquid cooling capabilities. It has a chamber concept in place as it is divided into two main chambers. The upper chamber holds the key to the cooling performance and the lower chamber is constructed for PSU and drive bays. A 200mm fan is pre-installed on the front panel and a 120mm fan is installed on the rear panel of the ATX case. The fan brackets can be adjusted for smaller fans and more fans can be installed accordingly by the user. This ATX case is highly customizable and is not particularly useful for an average customer who just needs a simple ATX case. This ATX case can be used for each and every purpose. This ATX case is stackable. So, it can be used for multiple purposes. It has a chamber system so everything is more systematic. There are two fans pre-installed on this ATX case. A 200mm fan on the front panel and a 120mm fan on the rear panel. Multiple cooling fans can be installed on this ATX case and there is also ample space for liquid cooling radiator systems. There is a tool-less drive bay design on this. The users can interchange the 3.5 inches hard drive cages at their will so that it suits their needs. The stackable feature of this ATX case makes it truly different from other ATX cases on the list. This ATX can be actually modified according to the user and the work. The pre-installed fans are a great addition to the bundle. There are many brackets for installation of multiple fans and liquid cooling radiator systems to keep the system really cool. The chamber concept makes everything a bit more organized and tidy. The tool-less drive bay design we talked about earlier is also a very good feature and is hard to find on other ATX cases. 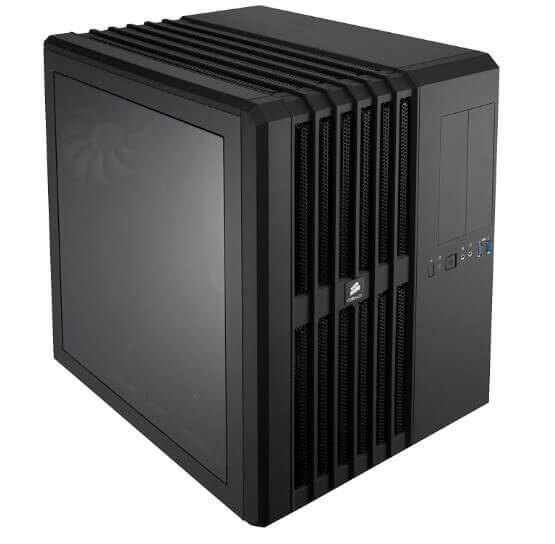 The price of this ATX case is really high and it is not ideal for an average user. 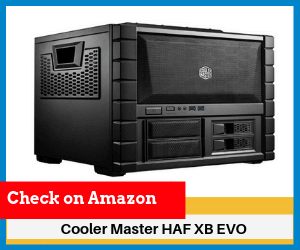 The Cooler Master HAF XB EVO is one weird looking ATX case. One would not be able to identify it as a normal cabinet. It is actually big enough to fit all the best components to make a high-end PC. It is primarily marketed as a LAN box and a test bench but it can be used for any purpose. It is a cube styled box and does not look very attractive but it surely is different from other ATX cases that you can find. The build is sturdy and it also has handles on the side which makes it easier to carry it around. This thing is mainly liked by LAN gamers. There are also some ventilation areas on the sides and a grill on the front. There are two 120mm XtraFlo fans pre-installed on this ATX case. It also has support for multiple fans on the front, top, and rear. This extraordinary ATX case is a bit expensive and also a bit different from the other ATX cases that you could find in the market. Still, it’s unnatural design saves it a spot on this list. This ATX case swiftly transforms into a test bench. Two 120mm XtraFlo fans are pre-installed on the front. There is support for up to four SSDs or HDDs. Proper ventilation is ensured as there are sufficiently many ventilation areas and grills provided on the frame. There are strong handles on either side of ATX case for easy transportation. It has an extremely rugged build. There are durable handles on the sides of the ATX case so that it can be easily moved around. Its unique build makes it different from the other ATX cases in the market. All the side panels, even the top one is easily removable. It offers splendid ventilation as there are adequately many ventilation ducts and a front grill. The 120mm XtraFlo fans are a great addition to the overall bundle. There are plastic tabs on the front panel which tend to be less durable. Some people might not like its old-school design and build. 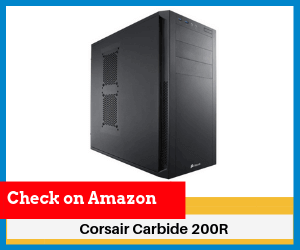 The Corsair Carbide 200R is one mid-range ATX case. It offers a good, sturdy structure and is compact. Even though it is compact, it can house all the mandatory components easily. This ATX case has seven PCI-E slots. Four hard disk drives and four solid state drives can be installed on it at once. It has eight fan mounting points so that it offers the best ventilation. It also has dust filters behind the front fan that keeps the interior free of dust. There are USB 3.0, headphone and microphone ports right in the front. 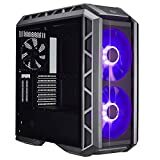 This ATX case has all the important features that a standard ATX case should have and all these things are provided at a price lower than most of the ATX cases on this list. Compact and sturdy but spacious enough for fitting necessary components. It has seven PCI-E slots. Four hard disk drives and four other solid state drives can be installed on this at the same time. There are eight fan mounting points on this ATX case. There is a front intake dust filter. It has USB 3.0 port, headphone and microphone ports on the front. The numerous PCI-E slots, support for four HDDs and four SSDs simultaneously and the number of cooling fans that can be placed are all great. The strong build and the compact size of this ATX case is the highlight. Its compact build does not have any effect on the number of components which can be placed inside this ATX case. 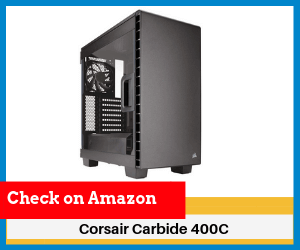 This ATX case has been aggressively priced by Corsair at it is very budget friendly and offers all the important stuff which should be present in a standard ATX case. It does not have a transparent glass panel at the side so it does not follow the latest trend. There are no pre-installed fans on this ATX case. 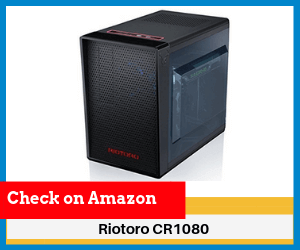 The Riotoro CR1080 is certainly the smallest ATX case in the list that is highly preferred for gaming. It actually looks like a really small speaker system. Despite being small in size, this ATX case supports full-size ATX motherboards. This ATX case also has a two-chambered design so that all the important components fit in easily and nothing looks crammed up. It includes a pre-installed 120mm blue LED light fan. The buttons on the top panel are RGB lit so that people can customize the color as they want. There is also a transparent glass side panel which lets us view the inner elements of the setup. The cable management on this ATX case has been taken care of by Riotoro. It is carefully engineered so that a person can easily place all the wires and conceal all the loose cables. 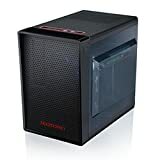 The price of this ATX case is also not too high. In fact, it is very inexpensive and gives us all the desired features including the trendy transparent side glass panel. It has an extremely compact build but full-size ATX motherboards can easily be accommodated inside this ATX case. It has a dual compartment design which has specific paths for direct airflow which further helps in effective cooling. It has cable mounting points and routing paths to hide all the unnecessary cable clutter and also improve the overall airflow. This package includes a 120mm blue LED light cooling fan. 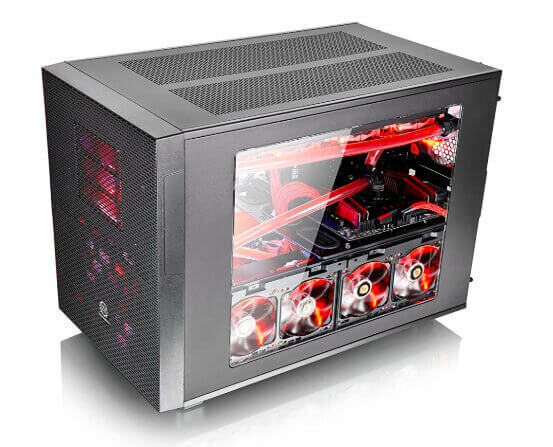 It has a transparent side glass panel which gives a clear view inside the ATX case. It’s compact but spacious structure makes it very useful. The pre-installed 120mm blue LED light cooling fan is decent. The cable mounting provided is great. It helps clear the untidiness of the wires and cables. The trendy transparent glass side panel adds up to the looks of the ATX case. The dual compartment design makes everything look cleaner than usual. The RGB light buttons are a nice addition. We can change the colors of the buttons according to our wants. It does not have any slots for an optical drive. This exclusive guide is for you if you are just beginning to assemble your first gaming PC. Talking about the ATX, you have to choose between ATX, micro-ATX and mini-ITX. You have three different versions due to the motherboard size categories. The ATX is the largest followed by micro-ATX which is a bit small and the mini-ITX being the smallest in size. So, for better understanding, the ATX case is compatible with both micro-ATX and mini-ITX because both of them have smaller motherboards so they would easily fit inside the ATX. Micro-ATX Motherboard size- 9.6 × 9.6 inches (244 × 244 mm). 1. A great ATX case is durable and strong. We suggest you avoid buying cases that have plastic built including the ones which do not come with tempered glass. Overall, the whole idea of buying an ATX is that it prevents your inside system, so, it needs to be strong and durable. 2. Do not fall for an astounding design. The ATX should also support proper airflow system. 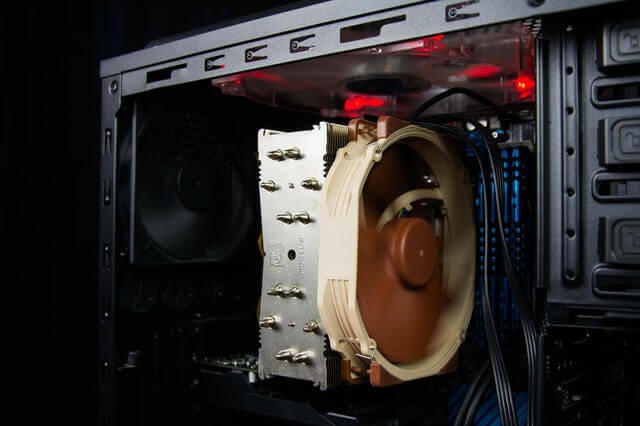 You would not want your PC to overheat and die in midst of playing your favorite game. 3. Wire management also plays an important role. The case that you intend to buy should have a proper mechanism for wire management. 4. Design and LED lights would be cherry on top. However, do not eventually fall for it without considering the above points. Congratulations! You can now buy your compact and small ATX case. 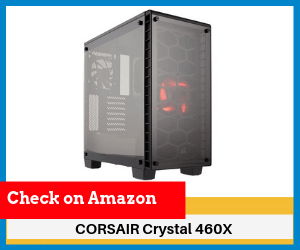 Though Thermaltake Core G3 is the thinnest and smallest ATX case covered in this post, our top recommendation would still be Corsair Crystal 460x for its top rated reviews and performance. This case has literally got everything and anything you need or would expect from a compact size ATX case. The tempered glass makes the case strong, mid-tower design supports integrating different graphic card configurations and what not. Do share with your views about this post in the comments section below. Also, we are open to your doubts, queries, and suggestions. Important: The images used in the post are taken from Amazon and stock photo sites (Flickr, Pixabay). 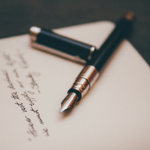 The editorial team at TheTechSwag consists of a group of highly enthusiastic writers and product reviewers who strive to deliver nothing but excellence.